Tele Vue 8-24mm Click-Stop Zoom Eyepiece. Illustation courtesy of Optics Planet. 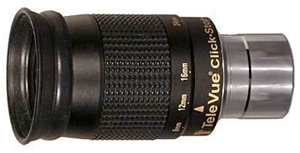 Sadly, the legendary Tele Vue 8-24mm Click-Stop zoom ocular was discontinued in 2009. This beautifully finished ocular was fully multi-coated and its optical design used seven lens elements in four groups. It has been replaced in the market place by the Vixen NLV 8-24mm Click-Stop zoom. (Vixen manufactured the Click-Stop zoom for Tele Vue; see the Astronomy and Photography Online index page for a review of the Vixen version.) Throughout its production life, the Tele Vue Click-Stop zoom was regarded as the best variable focal length ocular on the market. It had a reputation for being a sharp eyepiece with good contrast and it offered adequate eye relief. The Tele Vue Click-Stop zoom was designed to accept Tele Vue DIOPTRX astigmatism correction lenses (the Vixen NLV does not), so that eyeglass wearers can view without their glasses. These fit below the ocular's rubber eyecup ring. Tele Vue claimed that this zoom "combines beautifully with our Barlow lenses." Like all good zooms (and other Tele Vue oculars), it was rather expensive, with a 2009 online discount price of around $210. A zoom eyepiece is not intended to replace the fixed focal length oculars in its focal length range, as some inexperienced buyers assume, but as an addition to them. Zooms are handy for determining the correct eyepiece focal length that the subject and seeing conditions will allow. Zooms allow the observer to fine tune the exit pupil to obtain the best overall contrast, especially when using nebular filters. They are also useful when several people are using the same telescope and want to see the subject at various magnifications, as at star parties. · Mounting barrel diameter - 1.25"
A characteristic of all zoom eyepieces is that their apparent field of view narrows as the focal length increases, the exact opposite of what you would expect and what you want. In other words, at low magnification, where you probably need the widest possible field of view, the zoom delivers its smallest field of view. The Tele Vue 8-24mm Click-Stop Zoom has an apparent field of view of 55 degrees at 8mm, but only 40 degrees at 24mm. The eye relief also varies, but in the case of the Tele Vue zoom it is a reasonable 15-20mm, depending on focal length. The Click-Stop Zoom is supplied very nicely packaged in the usual Tele Vue black box. Inside the box, the Zoom was encased in bubble wrap to prevent movement during shipping. There was an instruction sheet, Tele Vue ocular specification sheet and a self-adhesive strip of friction tape that can be attached to the mount barrel for use in collet retention bino-viewers. (The Tele Vue Click-Stop Zoom is very popular for bino viewers, for which its click-stop feature makes it uniquely suitable.) The tape is unnecessary when the ocular is used in ordinary telescopes and star diagonals. The external finish of the Tele Vue Zoom is matte black and the Tele Vue name, as well as the numbers 8, 12, 16 and 24 (denoting the click stops for focal length settings) are silk-screened in gold, rather than engraved and filled with the bright green color used to mark most Tele Vue oculars. These click stops serve as positive focal length reference points, but the zoom ring can be set anywhere between clicks. The top of the ocular is graced by a soft rubber eyecup that can be folded down for use by eyeglass wearers. The bottom (mounting) barrel is heavily chrome plated to resist scratching. Most zoom oculars are visibly inferior to equivalent fixed focal length oculars, but some of the latest generation zooms can provide very good views and the Click-Stop zoom leads the way in that regard. It has a large, checkered rubber zoom ring that you turn to change focal lengths, as opposed to the slide in and out method of zooming that is used for many photographic zoom lenses. There is a fair amount of resistance to turning the zoom ring, so focal length settings are unlikely to be accidentally disturbed. Visually, the image quality of the Tele Vue Click-Stop zoom is similar to that of good fixed focal length oculars. It provides sharp, clear views of terrestrial, planetary and deep sky subjects. However, its restricted apparent field of view at the long focal length end can be a problem for finding faint objects, as well as for viewing extensive subjects, such as the Andromeda galaxy. The Click-Stop zoom's smaller field of view was very apparent when compared to the 18mm and 25mm Celestron X-Cel oculars, which have a 55-degree apparent field. At 24mm, its AFOV shrinks to 40-degrees and its field of view at 18mm is not much better. On the other hand, the Click-Stop zoom's 20mm eye relief at the 24mm setting was identical to that of the X-Cel oculars and it appeared to be as sharp and contrasty as these two fixed focal length oculars. In the medium focal lengths I had 14mm and 12mm Tele Vue Radians for comparison, which provide a 60-degree apparent field and 20mm of eye relief. The disparity in AFOV remains obvious between the 18mm and 12mm settings, but it seems to matter less as the magnification is increased (focal length decreased). In terms of the quality of the zoom's image, it remained high. The 14mm and 12mm Radians seemed to have a little better contrast and visual "snap" than the Click-Stop Zoom at equivalent settings, but the sharpness of all three eyepieces was very good. Radians are excellent oculars, but the Click-Stop Zoom was able to hang in there with them, at least subjectively. Frankly, I was surprised by the high performance of this zoom compared to these excellent, fixed focal length Tele Vue oculars. At the high magnification end, I had 9mm and 7mm Burgess/TMB Planetary oculars on hand for comparison. These oculars offer a 60-degree AFOV compared to the Click-Stop Zoom's maximum 55-degree AFOV at 8mm. High magnification is not normally used for expansive subjects, but to resolve fine details. Once again, the quality of the Tele Vue Zoom's imaging was surprisingly good. At 9mm, the Burgess/TMB perhaps resolved a touch more detail, but it would be hard to say for sure. What I could see through the Burgess/TMB, I could see through the zoom set at 9mm. The seeing was not good enough to support more magnification, so setting the zoom at 8mm and using the 7mm Burgess/TMB gained nothing in terms of resolving fine detail. One point worth mentioning is the excellent color rendition of this Tele Vue zoom. When I used it for some terrestrial observation, I was very pleased with the bight, well saturated views of leaves, birds and even an errant bee a hundred or so yards away that had absolutely no idea she was under surveillance. My conclusion is that the Tele Vue Click-Stop Zoom is an exceptional performer. It gives up little to the highly rated oculars to which I compared it. This zoom is equal to the (visual) imaging performance of good, fixed focal length oculars. I never thought I'd see the day when I'd write those words! All Tele Vue oculars are individually inspected and quality controlled at the Tele Vue facility in Chester, New York before they are sold. This assures consistently high quality. I would recommend the Tele Vue Click Stop Zoom to anyone who wants a top quality zoom ocular and can find one.